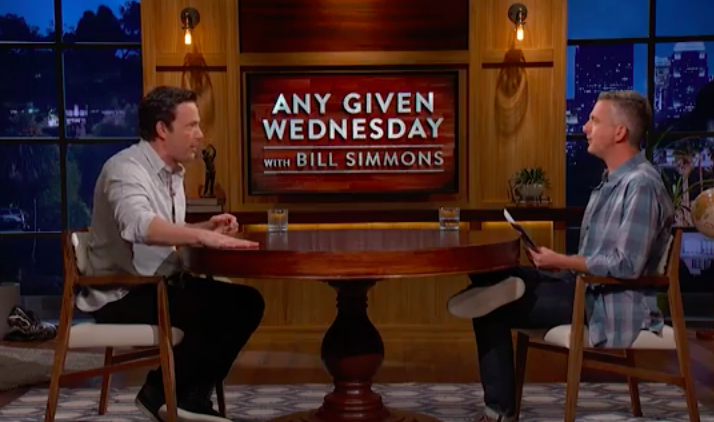 Ratings expectations were not enormous headed into the premire of HBO’s new Bill Simmons-hosted talk show Any Given Wednesday. While Ben Affleck’s profanity-laced rant about Deflategate certainly made waves, initial ratings imply that audiences are going to need some time to get as worked up. Any Given Wednesday premiered to an 0.12 adults 18-49 rating and 0.26 million live+same-day viewers. For perspective, that ranked 78th among original cable telecasts on Wednesday. Other programs that ran at the same 10:00 p.m. hour include OWN’s Greenleaf (0.56 adults 18-49 rating), MTV’s Challenge: Rivals III (0.51), HGTV’s House Hunters (0.44), USA’s Royal Pains, (0.34), Fox News’ Hannity (0.24) and CNBC’s Jay Leno’s Garage (0.12). AGW was always going to be a bit of an uphill climb, ratings wise, so this is hardly terrible news. It simply means that the built-in audience for Simmons is only so big and now it’s on him to prove that he’s capable of attracting consistently-appealing guests and creating the kind of program that people need to tune into. Easier said than done, but considering the investment HBO has put into Simmons, they’re likely willing to slog through some low ratings for a while if need be. As for that premiere, our own Ian Casselberry thought that Simmons was able to overcome the awkward initial impressions to find some interesting moments in interviews with Charles Barkley and Ben Affleck (though interesting might not be the specific word for the latter). Many other critics, however, were not so kind. It isn’t often that C-SPAN trumps HBO in terms of new and original programming, but on Wednesday night that’s exactly what happened. It wasn’t all damning, however. Deadspin’s Patrick Redford said it was “exactly what you’d expect,” though you’d hardly come away from the post thinking that’s a good thing. Liz Shannon Miller at IndieWire ended up giving what passes as a glowing review for the show. Simmons clearly has his work cut out for him if he wants to win over some, but perhaps it would be better for him to more clearly define how different his program will be from other sports talk shows. Expectations are working against Any Given Wednesday for the moment but there’s still plenty of time for recalibration. If nothing else, just have Affleck back on to talk about the Celtics’ draft picks.